Solomon’s Castle is silver plated, and features stained glass created by Howard Solomon. There are roadside attractions that are centres of power, author Neil Gaiman says. His book American Gods takes us to a few of them, and we’ve visited some ourselves, like the House on the Rock and Rock City, and they are truly powerful in their kitsch. Then there’s Solomon’s Castle, which isn’t in American Gods, but easily could be. 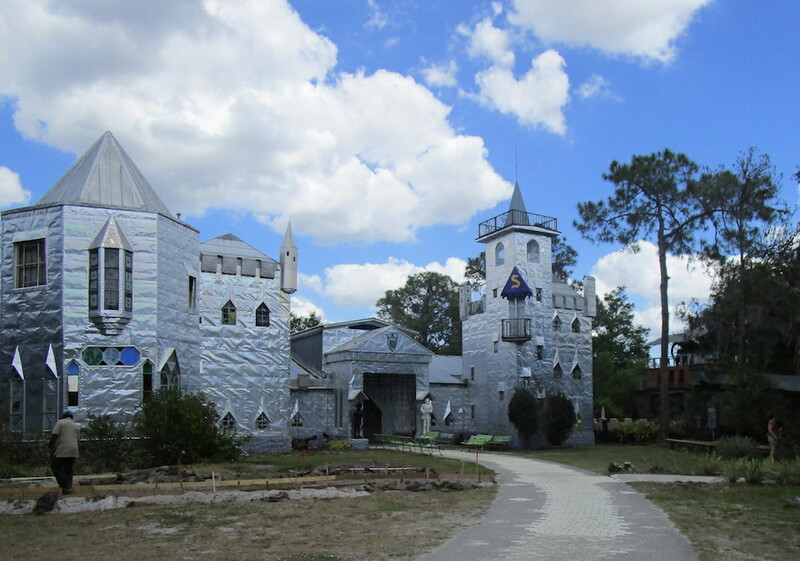 The silver palace in the middle of a Florida swamp is the brainchild of writer, sculptor, and lifelong eccentric Howard Solomon, who built the castle’s outer walls of old typesetting plates, news-side-in. There are metal-sheathed guards, and a full-size boat in the boggy “moat.” Everything, from the stained glass to the strange menagerie we will encounter inside, was created and installed by Solomon over decades. He died in August at 82, but his wife still lives in the castle. Behind the castle is the full-size Boat in the Moat, which features a restaurant and more puns. Our tour guide, Ricky, is scripted within an inch of his life, and he spends an hour blasting facts like buckshot. He kind of warns us about the puns. It seems Solomon was some sort of three-dimensional-word genius, weaving language and sculpture and play to justify his junk collecting. Ricky shows us a three-foot sculpture of a woman called Busting Out. She’s just been released from prison and she represents freedom, he says. He tells us what old car part and found treasures went into making her, ending with the bicycle chains that are her hair. “We call this a permanent permanent,” Ricky says with an eyebrow wiggle. It would take days to examine the curiosities Solomon created in this sanctuary that he called his time castle, where it’s okay to touch things so long as you’re respectful, and you can get up close to see each piece of flaking rust or to peer more closely at masterful wooden reproductions of classical art. Howard Solomon, a self-portrait in wood. I ask Ricky where Solomon found his material and he laughs. “Anywhere and everywhere. People’ll’d bring him stuff.” Then he’s back on script. “The garboyle over there, guys, I had not a clue what it was when i got to the castle. The garboyle is 800 pieces of metal. They say it lays eggs, it eats the eggs, and then it becomes … eggstinct. “Now let me introduce you over here to Lionel.” Without skipping a beat he’s moved on to the life-size metal lion that’s leaning toward us. “Now, if Howard was here, he’d let you know it’s got two glass eyes up front and two steel balls in the back. Then he’d ask you, ‘Know what this is?’ “ He’s holding up a baseball bat that was lying at Lionel’s feet. “No, ladies, it’s not a ball-buster. Howard would let you know. Lionel, who comes with his own club. The Lion’s Club indeed. If you have the stomach for the puns, Solomon’s Castle is tucked away in the backroads of inland Florida. We had an adventure trying to see this place five years ago and we’ve been wanting to come back ever since. It was absolutely worth the wait. Awesome! I visited Florida recently and my only disappointment was not getting to see more of these wacky tourist-traps that proliferate down there. This one seems like a true diamond in the rough! That’s one of the things we love most about Florida — there’s something weird around every corner, which means we keep going back and not get bored.